Many people use the terms "dashboard" and "scorecard" interchangeably, but there is a significant difference between them. A scorecard is a type of report that displays a collection of key performance indicators (KPIs) together with performance targets for each KPI. A dashboard, on the other hand, is a container for a related group of scorecard and report views that are organized together. In other words, a dashboard contains a collection of other items such as scorecards, reports, and filters. A report is the presentation of data transformed into formatted and organized information according to specific business requirements. A scorecard measures performance against goals. Typically, a scorecard displays graphic indicators that visually convey the overall success or failure of an organization in its efforts to achieve a particular goal. The scorecard is based on a collection of key performance indicators (KPIs), each of which represents an aspect of organizational performance. Taken together, these KPIs provide a snapshot of organization performance at a particular point in time. The following screenshot shows a typical scorecard. A KPI is a metric that is tied to a target. The KPI usually represents how far away a metric is from its pre-determined target. The KPI score and its indicator are designed to let a business user know at a glance if results are on target or off target. Indicators, sometimes called icons, are graphical elements that give visual cues about performance. Traffic light symbols are used—red to indicate a problem, yellow to indicate a potential concern, and green to show that performance is meeting or exceeding its goal. However, other types of indicators, such as check marks or smiley faces, are available, depending on the program that is used to create the scorecard. A dashboard is a container for various types of reports, including scorecards. It might consist of one or more pages, and it might have more than one module on each page. A typical dashboard might contain a scorecard, an analytic report, and an analytic chart, but many variations are possible. Some dashboards provide users with a high level of interactivity, and others display static images. The degree and kind of interactivity depend on the program that is used to create the dashboard. The business intelligence dashboard is often confused with the performance scorecard. The main difference between the two, traditionally, is that a business intelligence dashboard, like the dashboard of a car, indicates the status at a specific point in time. A scorecard, on the other hand, displays progress over time towards specific goals. Although many people use the terms “dashboard” and “scorecard” synonymously, there is a subtle distinction that is worth understanding. 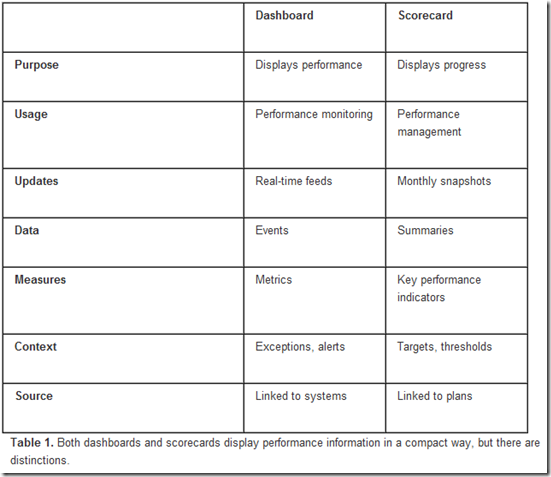 While both Balanced Scorecards and Dashboards display performance information, a Balanced Scorecard is a more prescriptive format; a true Balanced Scorecard should always include these components: Perspectives (groupings of high-level strategic areas), Objectives (verb-noun phrases pulled from a strategic plan), Measures (also called Metrics or Key Performance Indicators/KPIs), and Stoplight Indicators (red, yellow, or green symbols that provide an at-a-glance view of a Measure’s performance). These specific components help ensure that a Balanced Scorecard is inherently tied to the organization’s critical strategic needs. The design of Dashboards, on the other hand, is much more open to interpretation. Most Dashboards are simply a series of graphs, charts, gauges, or other visual indicators that a user has chosen to monitor, some of which may be strategically important, but others of which may not. Even if a strategic link exists, it may not be clear to the person monitoring the Dashboard, since the Objective statements, which explain what achievement is desired, are typically not present on Dashboards.